Historic and current ridge habitat loss occurs in the form of subsidence and shoreline erosion along Bayou La Loutre. The shoreline erosion is caused by increased boat traffic diverted due to the closure of the MRGO channel. Ridge habitat consists of Live Oak Hackberry Maritime forest which is utilized by trans-gulf migratory bird species as a first and last stop when crossing the Gulf of Mexico. This critical habitat is rated as S1-Most Critically Imperiled (State Natural Heritage Program) and S2 priority by the state of Louisiana. Interior marsh loss along Lena Lagoon is caused by subsidence, sediment deprivation, increased wave fetch and construction of access and navigational canals. The integrity of the Lena Lagoon shoreline has been breached, and loss of this wetland buffer will expose the La Loutre ridge to highly erosional winter storm events. The goal of the project is to create an approximately 31.7 acre ridge feature with material from bucket dredging Bayou La Loutre. Additionally dredged material from Lake Borgne will create 163 acres of marsh and nourish approximately 258 acres of marsh along Lena Lagoon (421 acres total). The proposed project will create approximately 5.46 miles (28,855 ft) of ridge along Bayou La Loutre and 24.4 acres of Live Oak/Hackberry Maritime forest habitat. The ridge habitat will be built centerline along the bank of the bayou. The structure will have a +4 elevation with a 5:1 slope on the bayou side and 3:1 slope on the marsh side. Additionally the newly created ridge will include herbaceous and woody plantings with smooth cord plantings along the toe. 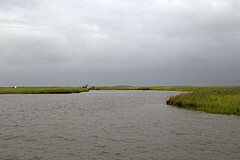 The Lena Lagoon site will create and nourish approximately 421 acres of marsh using sediment dredged from Lake Borgne. Lena Lagoon will have a semi-confined south and east flank and a fully confined north flank. Containment will be degraded as necessary to re-establish hydrologic connectivity with adjacent wetlands. This project is located in Region 1, Lake Pontchartrain Basin and Breton Basin, St. Bernard Parish.